In 1588, Spain's King Phillip II (1527-1598) decided to vanquish the wicked British once and for all. The Spanish Armada lumbered its ungainly way up the English Channel that June, where it was unceremoniously bashed by both characteristically awful Channel weather and the Royal Navy. By the time the surviving half of the formerly mighty Armada had returned to Spain in September of 1588, it had become plain to all that Spain's days as the domiating naval presence in the Atlantic were over. Cuba is there. Santiago, meanwhile, is there. Without this naval protection, Spain's overseas colonial possessions found themselves increasingly vulnerable to English tomfoolery, mostly of the swashbuckly corsair and piracy sort, and thus needed to fortify! Santiago de Cuba, founded in 1514 and Cuba's colonial capital city at the time of the Armada's vanquishment, had already been plundered by the French in 1533. 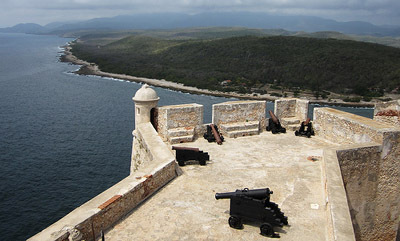 A squeaky little fortification was built from 1590 to 1610 in the location where the Castillo of our intertest now stands, as protection from pirates and other scalliwags, but plans for something substantial didn't begin until 1639. 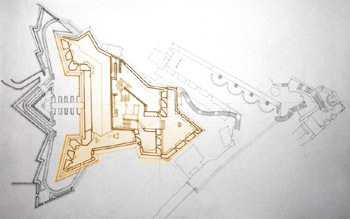 Design of the Castillo de San Pedro de la Roca is credited to Giovanni Battista Antonelli, a Milanese military engineer, although research indicates that this gentleman died in 1588, which would make him designing a fort in 1639 a pretty neat trick. 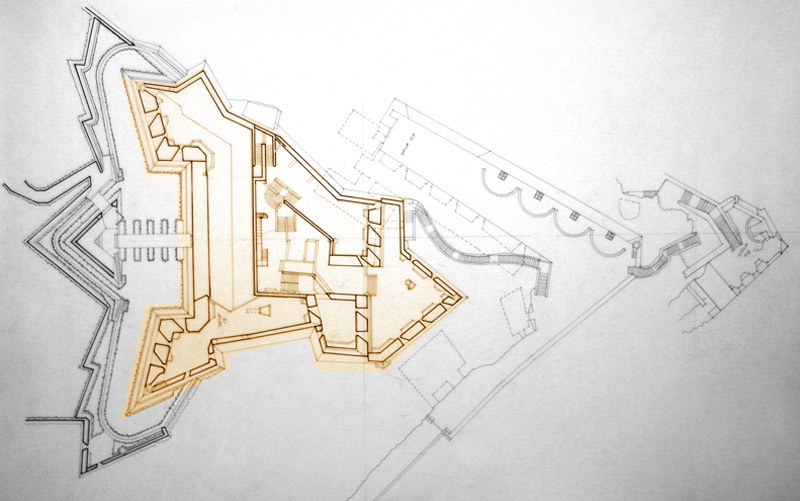 Whomever we can thank for its design, the Castillo was constructed over 42 years spaced out between 1638 and 1700. It was built onto and into the rocks of a promintory that juts into Santiago Bay in a threatening manner. Arrayed in a terraced fashion on several layers of rocks, San Pedro has four levels for artillery, and its citadel is at the top. because through the 18th century Fort St. Francis/François/French was the focus of much high-society beverage sipping. King Louis XIV (1638-1715) had made the development of Dunkirk into a viable port city a priority at the beginning of the 18th century, however, so Bergues' days as an important commercial hub were numbered. In the early days of the French Revolutionary War (1792-1802), France declared war on just about everybody they could think of. As a result, England's Prince Frederick, Duke of York (1763-1827) was at the head of a British/Hanoverian army that was marching around northern France besieging things in 1793. Fort Vallières (which technically wasn't known as Fort Vallières yet, but in the interest of retaining some small amount of sanity I'll just start referring to it as such at this point) played an important role in York's failed siege of Dunkirk, in that the Bergues Canal was blocked at the fort, helping to flood the land around Dunkirk. This made things unpleasant for York's troops (You want us to fight in wet boots? Forget it! ), which helped lead to the British defeat at the Battle of Hondschoote (September 6-8, 1793). Toward the end of the 19th century, the fort of our current interest finally achieved the name Vallières. Which person named Vallières it was named after is in dispute: Either a friend of King Louis XIV or a Governor of Bergues. Whatever, it's a much better name than Fort St. Francis/François/French. During the Franco-Prussian War (1870-1871), Prussian prisoners of war were housed at Fort Vallières. During the First World War (1914-1918), an army radio station was operational at the fort, and anti-aircraft guns were installed in 1917. Locals came during air raids to hunker down and wait out the bombing. In 1940, Fort Vallières was serving as a French Navy radio outpost, and received two 155mm artillery pieces on May 26th, to help defend Bergues from the coming German tide. 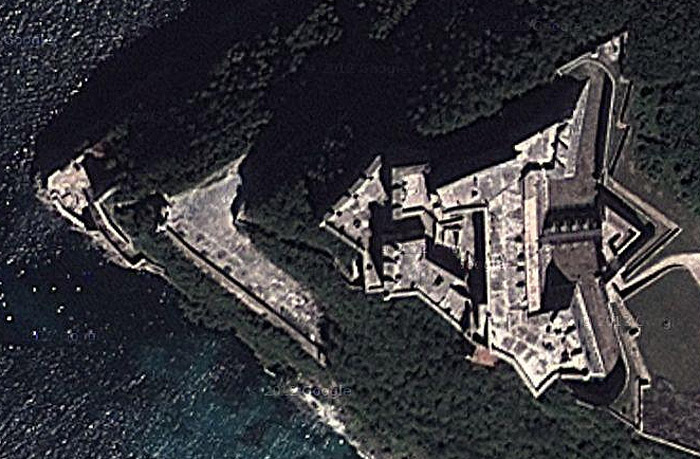 The Nazis felt that this 17th century fort was worthy of some attention in their Dunkirk-conquering process, so sent Stukas to do some of the dive-bombing for which they are justly famous, on June the 1st. headed to help in the defense of Dunkirk...which fell to the Germans on June 4, 1940. 80% of Bergues was destroyed during the Second World War (1939-1945): Had the attacking Germans done so on foot, using only 16th or 17th century weapons, Fort Vallières would've sent them back to Berlin with bloody noses: Had technology stopped dead in the 17th century, starforts would still rule the waves today. BUT this whole mechanized warfare thing somehow came into being, and starforts were left behind. Sorry, Bergues! The French government shoved the ruined fort towards local residents in 1961 and said something like, "Here, y'want this piece of junk?" The city of Dunkirk acquired Fort Vallières in 1967 and set about making it a useful property. Today, it's difficult to surmise how useful it might be, but the fort is obviously a regional tourist attraction.